In August 2010, seven inches of rain fell over a 12 hour period, washing out a critical bridge on Town Highway 9 in Eden, Vermont, and calling for an emergency bridge replacement. CCS Constructors partnered with Contech Construction Products Inc. and were able to design and install an environmentally friendly solution. “Contech representative Steve Wolf P.E. did an excellent job assisting us in the selection of a structure, which was not only environmentally friendly, but also has an adequate hydraulic opening” stated Chris Chauvin, President of CCS Constructors. A 28-ft.-3-in. x 8-ft.-7-in. 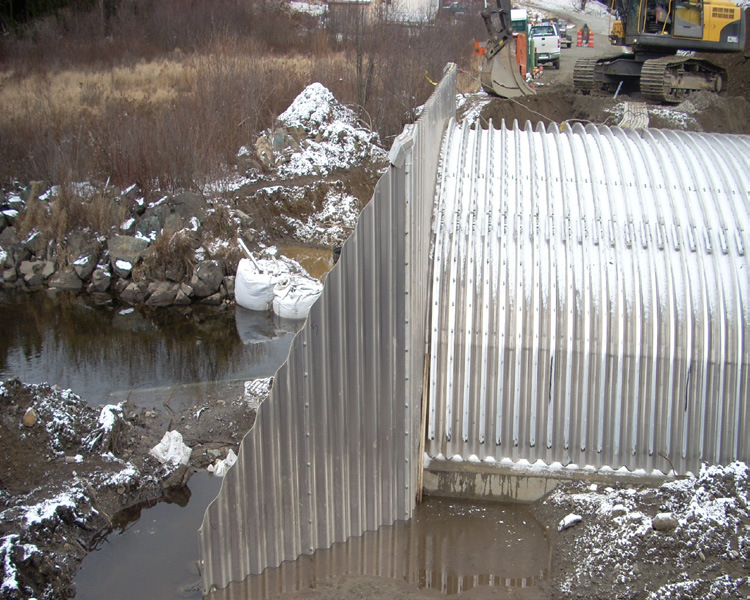 x 36-ft. Aluminum Box Culvert was chosen over a precast structure for its ability to be manufactured and installed quickly. This option, which included aluminum headwalls and wingwalls, allowed for the road to be reopened just a few months later - in November 2010 - before winter set in. In addition, the open bottom structure provided an environmentally friendly solution. The bridge was installed onto 6-ft. wide x 7-ft. tall precast pedestal foundations that were buried below the potential scour and frost depth of northern Vermont. The structure was also designed to minimize dewatering requirements during construction through the use of precast and preassembled components.